Scuffles broke out and 15 people were arrested during demonstrations by the Anonymous movement at Buckingham Palace and Parliament. 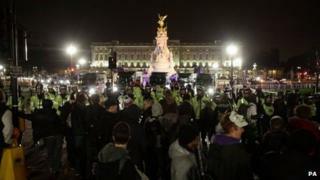 Hundreds of protesters started a fire near the palace and blocked Parliament Square in the Bonfire Night protests. The demonstrators, many wearing Guy Fawkes masks, were confronted by police, some of them in riot gear. The protest against austerity cuts, corruption and state surveillance were promoted as #MillionMaskMarch. Anonymous was due to hold protests around the world, with similar events in Japan, Australia and New Zealand. Linked protests took place in more than a dozen Brazilian cities including Rio de Janeiro, where traffic was brought to a standstill. Activists also took to the streets in Washington, Philadelphia, Berlin, Madrid, Dublin, Warsaw and Beirut. Comedian Russell Brand was pictured attending the protest in London, while Green Party MP Caroline Lucas tweeted she had taken part. Protesters said they planned to burn energy bills as part of the events in London. Of the 15 arrested in London, three have been charged with public order and assault offences.